With viewing events at: Poole Central Library, Aldeburgh Library (Suffolk), Idea Store Whitechapel, Grants Hill and Fulwell Cross Libraries (Redbridge), Jersey Library, the Mitchell Library (Glasgow), Winchester Discovery Centre, Kidderminster Libraries, Newham Libraries, Coventry Libraries and more. George Orwell’s classic book on 1930s poverty in Paris and London, is brought to life in an immersive, live theatrical event combining performance, music, film, poetry and story-telling for the first time at Stone Nest in the heart of London’s West End. Orwell’s ground-breaking exploration of poverty and homelessness, Down and Out in Paris and London (1933), has a searing relevance to the issues of today. 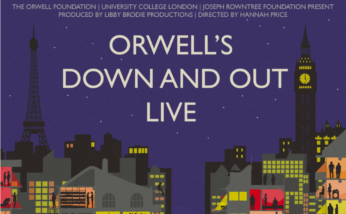 The Orwell Foundation has worked for a year to make this event possible: bringing together Libby Brodie Productions, UCL and the Joseph Rowntree Foundation in collaboration with The Connection, YMCA, Centrepoint, Crisis and Streetwise Opera. The London performance will be followed in the Autumn by an event in Paris. When at a very late stage its planned venue became untenable, Stone Nest in the former Welsh Chapel on Cambridge Circus, a performing arts venue a short walk from UCL’s Bloomsbury campus, stepped in at the last moment – generously donating the space in-kind, for which we are all enormously grateful. Orwell wrote Down and Out in Paris and London as a result of his own experiences sleeping rough and working on what would now be called zero-hours contracts in hotel kitchens. The performance also draws on other Orwell work including his diaries, The Spike and A Clergyman’s Daughter. Readers include writers, activists, politicians, campaigners and young people who have been homeless. In a multi-disciplinary production, modern stories from the streets are experienced alongside the Orwell text. At Stone Nest, in the spirit of Orwell, we hope to help give expression to voices that are rarely heard, a platform for people who are not seen, and to raise uncomfortable truths about our society. Many people have contributed their time and experience to make this project a success. The performances – in London on 6th June as part of UCL’s Festival of Culture, and Paris in late September – are by the same team who produced the acclaimed reading of the whole of 1984 on a single day in 2017. Each performance will be accompanied by discussions and workshops on the contemporary challenges of homelessness and poverty. The performance of the text has been re-imagined by Director Hannah Price and Producer Libby Brodie – who staged – with the Orwell Foundation – the successful first ever public reading of the whole of 1984 last year at Senate House. This NEW WORK will be live-streamed into libraries and venues across Britain and can be watched from all over the world. The performance will be followed by an expert panel discussing the policy and political solutions that are needed to help solve the problems raised. 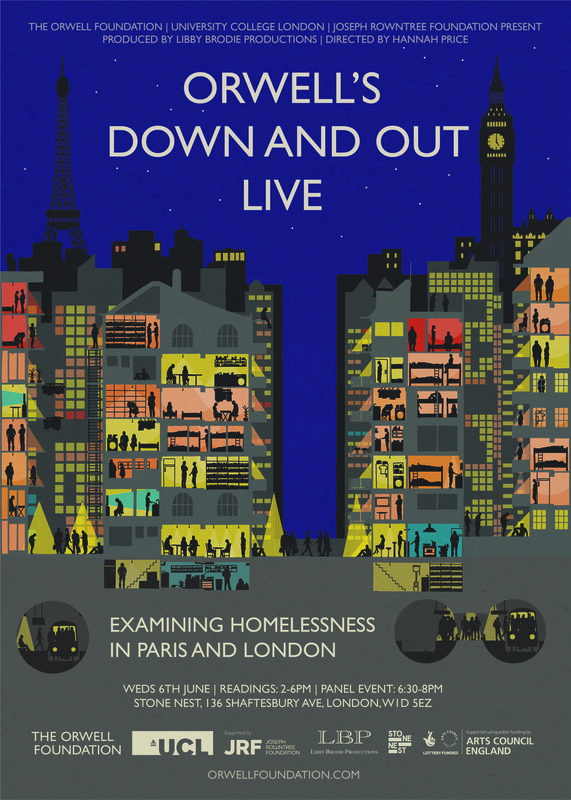 Down and Out: LIVE tries to use at least some of Orwell’s own research methods – learning about experiences at first hand. The ideas, the words, the immersive dramatization, the sets and sounds have been shaped by collaboration with people with experience of the variety of modern homelessness and poverty. The project has worked closely with service users from The Connection at St Martin-in-the-Fields and young people from the YMCA in Stoke (where the Orwell Foundation has run writing workshops) to collect individual stories of the journey to rough-sleeping and homelessness. Some who have bravely shared their stories will be readers on the day. Among other distinguished readers are Jon Snow, Bonnie Greer, Peter Hitchens, Simon Callow, Jack Monroe and Ben Aldridge. Four artists have been commissioned to create responses to contemporary homelessness and want. Poets Adam Kammerling, Sabrina Mahfouz and Joelle Taylor’s work will be part of the event. Edwin Mingard will make a film in reaction to the programme and the later event in Paris which will be launched later in the year. Hannah Price has worked to bring these various pieces and fuses them with some newly created scores from the contributing actors and musicians to create an original, evocative and ground-breaking new piece of theatre. For those unable to attend the London venue, or Paris in the Autumn, both performances will be live streamed and viewing events will be arranged in libraries and community hubs across the UK, with both the London and Paris performances being recorded in full and being made publicly available. For more information about libraries and community hubs can get involved, please click here. To download a copy of Edwin Mingard’s unique artwork to promote your screening, click here. Orwell strongly believed that art and literature could make direct and long-lasting change, focusing the minds and the empathies of his audience on the social or political evils of the day. This event will fuse live art and social activism in an outburst of theatre, music and literature. The performance will form the backbone of a narrative that explores and reveals what homelessness is, how it manifests and what damage is does to the individual and to society at large. The event, part of UCL’s week-long Festival of Culture, is being presented by the Orwell Foundation: an independent charity that is based at UCL alongside the Orwell Archive, which has been held at UCL since 1960.